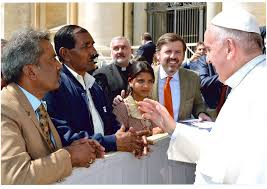 On February 24, 2018, Pope Francis met in private, for some 40 minutes, with Asia Bibi’s family — the Pakistani Christian sentenced to death –, with her husband, Ashiq Masih and Eisham Ashiq, one of their daughters. The Pontiff also received Rebecca Bitrus of Nigeria, victim of the radical Islamist group Boko Haram. For this meeting, which took place on the occasion of the International Day of Protest against the Persecution of Christians, organized by Aid to the Church in Need (ACN); the Director of ACN in Italy, Alessandro Monteduro, accompanied them. Speaking into the microphone of “Vatican Media,” Monteduro described the meeting as “extraordinary,” adding that it was focused on “the faith.” ”We prayed with the Holy Father . . . each one of us in our own language,” he specified. Christian Asia Bibi — Asia Noreen — has been detained in the Multan prison in Pakistan since June 2009. She was accused of blasphemy and sentenced to death, in the first instance, in November 2010, a sentence confirmed by the High Court of Lahore on October 16, 2014. An appeal has been made to the Supreme Court, and presidential grace has been requested.